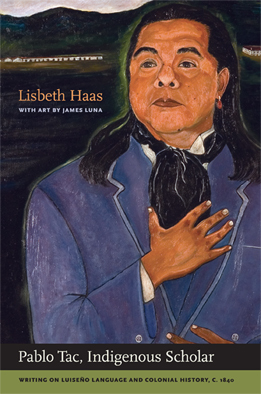 Professor Haas publishes new book, "Pablo Tac, Indigenous Scholar"
This volume makes available a remarkable body of writings, the only indigenous account of early nineteenth-century California. Written by Pablo Tac, this work on Luiseño language and culture offers a new approach to understanding California's colonial history. Born and raised at Mission San Luis Rey, near San Diego, Pablo Tac became an international scholar. He traveled to Rome, where he studied Latin and other subjects, and produced these historical writings for the Vatican Librarian Cardinal Giuseppe Mezzofanti. In this multifaceted volume, Pablo Tac's study is published in the original languages and in English translation. Lisbeth Haas introduces Pablo Tac's life and the significance of the record he left. She situates his writing among that of other indigenous scholars, and elaborates on its poetic quality. Luiseño artist James Luna considers Tac's contemporary significance in a series of artworks that bring Pablo Tac into provocative juxtaposition with the present day.